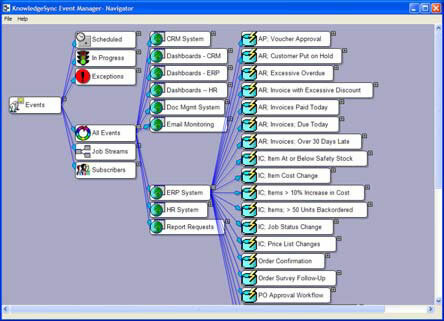 The above is an example of different application systems from ERP, CRM, HR Systems to Email Monitoring that can be setup. Today, every minute of every person’s workday matters – and now is the time to take a critical look at the tasks that each person performs and ask yourself “Could that task be automated?” If, for example, you have staff that are manually generating and sending invoices, creating POs for vendors, or tracking down late deliveries, an investment in Sage KnowledgeSync can save you tons of time by automating these tasks. Sage KnowledgeSync is a “monitor & response” system that watches for changing conditions within your business and automatically executes the appropriate response. 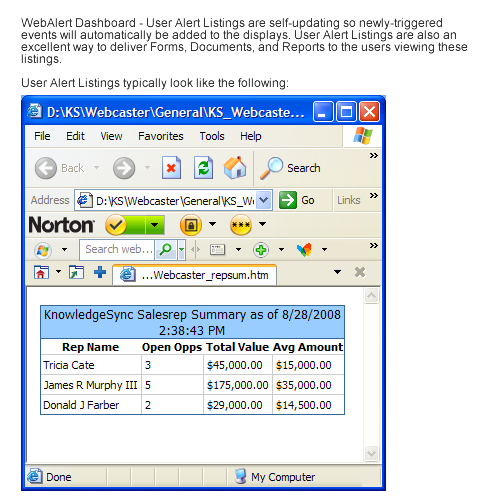 On the “monitor” side of the equation, it leverages familiar alert technology. You know, anytime inventory is running low, a new order comes in, or a shipment is late, someone in your company gets a real-time alert to their email, cell phone, fax machine, or PDA. But when it comes to the “response,” Sage KnowledgeSync really excels. After all, it may not be good enough to simply receive an alert because you still have to stop what you’re doing to take care of the situation … unless you have Sage KnowledgeSync. It works hand in hand with your Sage ERP Accpac or any ERP accounting as well as CRM system) so once an alert condition is triggered, it can be configured to automatically generate and fax a purchase order, run a report and email the results to you, send a reminder of an overdue invoice to your customer, display a WebAlert User ALerts Listing and just about any other action you’d normally perform manually. Sage KnowledgeSync comes preconfigured to monitor hundreds of common business conditions, and gives you the ability to specify an unlimited number of additional “trigger points.” So it’s easy to get your feet wet and have it up and running quickly. You can get started with Sage KnowledgeSync with a FREE trial. Contact us if you’d like more information about installing the free trial and if you decide that you like it, just flip the switch and go live.